If you are looking for a basic but yet functional compass for your outdoor adventure, the Silva Explorer should be your choice. Explorer features DryFlex™ grip for easy handling and comes with a use-anywhere declination scale inside the capsule, a magnifying lens, and base plate map-measuring in inches and scales of 1:62.5k mile and 1:24k USGS scale. 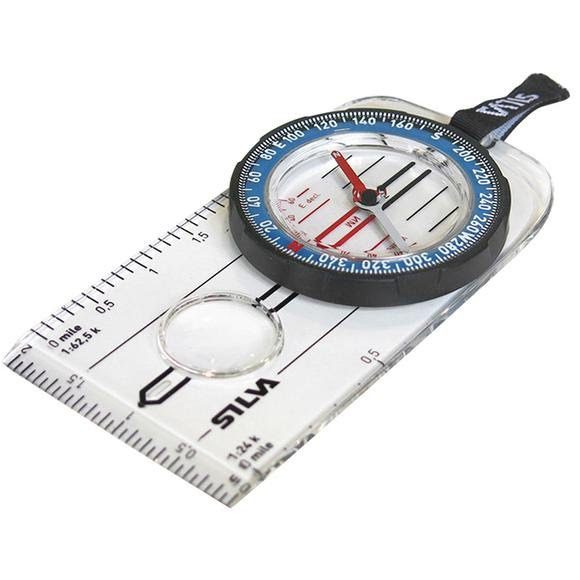 If you are looking for a basic but yet functional compass for your outdoor adventure, the Silva Explorer should be your choice. Explorer features DryFlex™ grip for easy handling and comes with a use-anywhere declination scale inside the capsule, a magnifying lens, and base plate map-measuring in inches and scales of 1:62.5k mile and 1:24k USGS scale. The baseplate has a curved-up at the back-end for perfect fit in the hand. The patented red/black North/South lines in the capsule bottom ensures easy and safe settling. The distinct arrow and scales/markings in a clear contemporary font combined with lots of transparency in the baseplate makes navigating easier - when activated in light the luminous markings enable night time navigation. The needle is made from finest Swedish steel with high quality magnetic features.